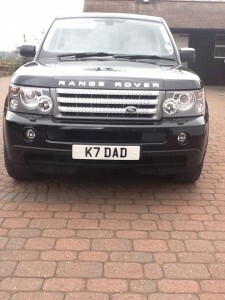 Reg Transfers gifts K7 DAD for my car! Those lovely people at Reg Transfers have made me a very special gift! My dear friend and Web Editor, Michele Andrew, knew that she when she saw the registration K7 DAD on Reg Transfers’ list of registrations for sale that it would be the ideal plate for me. 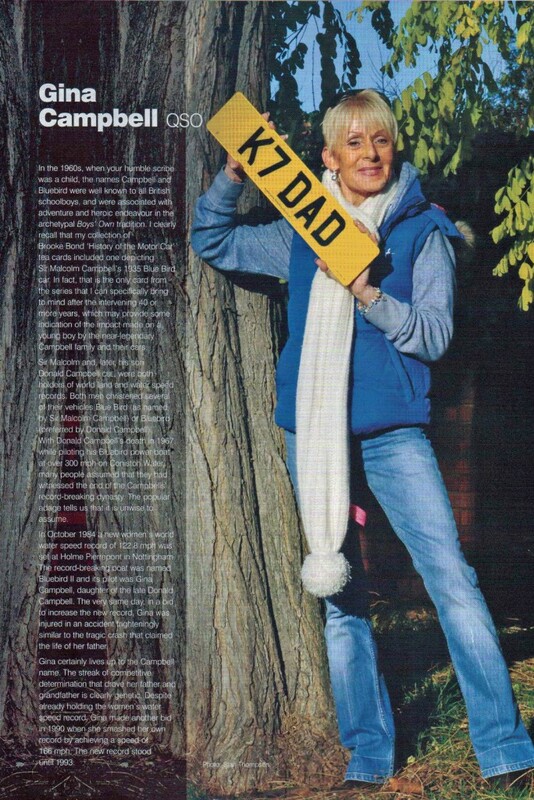 So, she approached the company (without me knowing anything about it) and, in a wonderful gesture, they offered the registration plate to serve as a permanent reminder of my daddy on my car. 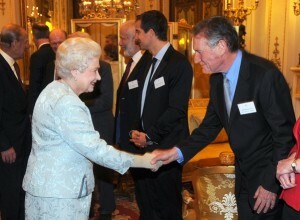 The plates were presented to me by Reg Transfers in London on the day I went to Buckingham Palace. I’m sure you’ll agree they look just the business. So, no more covert operations for me driving around with such a distinct plate! Gina was honoured by a Royal Invitation to attend a reception at Buckingham Palace on 8th December. The royal reception was held for those involved in exploration and adventure. On Gina’s last visit to Buckingham Palace, when she was awarded the Queen’s Service Order for her community services in New Zealand, Her Majesty told Gina how pleased she was to have been able to honour three generations of the racing Campbell family. Gina’s grandfather, Sir Malcolm was knighted by King George V in 1931. 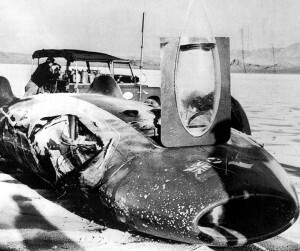 Her father, Donald Campbell, was made a Commander of The British Empire in January 1957 for his water speed record breaking – in particular for his record at Lake Mead in the USA. Yesterday’s reception was hosted by Her Majesty The Queen, with Prince Philip, Prince Edward, The Princess Royal and Princess Beatrice in attendance. Guests included Sir David Attenborough, mountaineer Sir Chris Bonington, world record holder Sir Ranulph Fiennes and documentary presenter Michael Palin. Younger explorers attending the Buckingham Palace party included yachtswoman Dame Ellen MacArthur, Chief Scout Bear Grylls and Edward Stafford, European Explorer of the Year 2011. Other guests included Brian Jones, who co-piloted the first balloon circumnavigation of the globe, Britain’s first astronaut Helen Sharman and Rebecca Stephens, the first British woman to climb Everest. As part of the reception there was be an exhibition of artefacts from Arctic, Antarctic and Everest campaigns over the past decades. 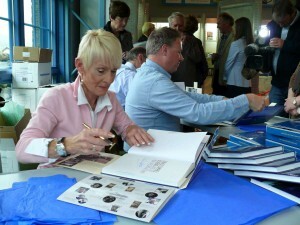 Gina was at The Ruskin Museum recently for the launch of Neil Sheppard’s book “Donald Campbell: Bluebird and the final record attempt.” A crowd of fans and original team members gathered for the first editions of this illustrated story of the last water speed record attempt made by Donald Campbell in 1966/7. Featuring a diary beginning with his first plans in June 1966, the preparations and modifications to Bluebird K7, the trials and setbacks at Coniston, the unsuccessful speed runs made in December 1966, and the runs over the Christmas holidays, the story is told right through to the attempt on 4 January, where Campbell lost his life. Disaster was not inevitable, but the team were aiming for an eighth speed record to add to their earlier successes. The book details the minutiae of the events as they occurred, and illustrates how frustrations regarding the attempt built up over time, to the extent that Campbell went from being optimistic that the record would be achieved within a matter of days, to the point where he become more and more beleaguered as the weeks rolled on, and finally, where he seemed to be about to pull victory from the jaws of defeat, only for circumstances to intervene which resulted in his death. 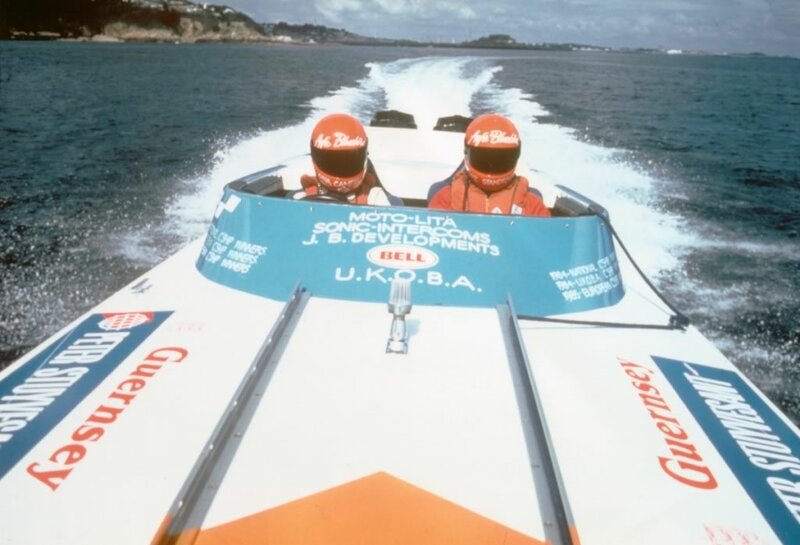 Gina headed back to Coniston for the Coniston Power Boats Records Week in October. “It was also the annual dinner of the famous K7 Club, with many familiar faces from the old days there. It was shocking to see a ghostly shape in the form of K7 on the water… no, it wasn’t a mirage, but was a replica boat made by Helical as a tribute to my father. Quite by chance, a lovely letter arrived in the post this week from the President of the Bonneville 200 MPH Club. The American club has formed a new chapter to honour my father – the 400 MPH Club. And, of course, enclosed was one of the embroidered caps, which I shall treasure indeed. 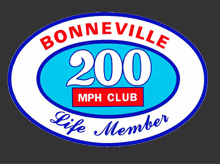 Warm thanks to all at Bonneville 200 MPH Club. The salt flats’ potential for racing was first recognized in 1896 by W.D. Rishel who was scouting a bicycle race course from New York to San Francisco. Rishel returned and convinced daredevil Teddy Tezlaff to attempt an automobile speed record on the flats. Tezlaff drove a Blitzen Benz 141.73 m.p.h. to set an unofficial record in 1914. 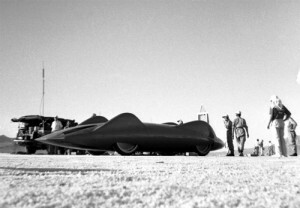 By 1949, the raceway on the Bonneville Salt Flats was the standard course for world land speed records. A pioneering group of land speed racers laid the foundation for what has turned into one of the largest, and certainly fastest, motor sports events in the world. On this natural straightaway the 300, 400, 500, and 600 mile per hour land speed barriers were broken. The original idea for the formation of a club to recognise the accomplishments of drivers setting speed records over 200 mph on the Salt Flats was the brainchild of So-Cal Special driver, Dean Batchelor, and Hop Up magazine editor, Lou Kimsey. The go ahead and support came from Hop Up magazine publisher Bill Quinnin in 1953. A review of the Club’s membership will find some of the most famous names in motorsports. Internationally recognised drivers Art Arfons, Craig Breedlove, Gary Gabelich, Don Garlits, Andy Granatelli and Andy Green are, of course, joined by Sir Malcolm Campbell and Donald Campbell. Donald Healy, Phil Hill, Bobby Isaac, Sir Stirling Moss, Richard Noble, Mickey Thompson and Bobby Unser have all raced on the famous salt flats. A look at the membership roster finds family names spanning several generations. The club currently boasts 15 female members, proving that land speed racing is not an exclusive ‘boys club’. Typically, speed trials are scheduled throughout the summer and fall at the Bonneville Raceway. Most events are open to the public. The annual Speed Week is usually held in mid-August. In 2013, Gina’s cousin Don Wales will be attempting a World Speed Record at Bonneville Salt Flats with a new Bluebird Electric car, capable of speeds in excess of 400mph. So it won’t be long before he’s sporting a new cap too.